These classic girls Fancy Eyelet Double Seat Baby Bloomers are trimmed with an embroidered eyelet lace. Embroidered with baby's name or monogram, and you have the ultimate personalized gift! 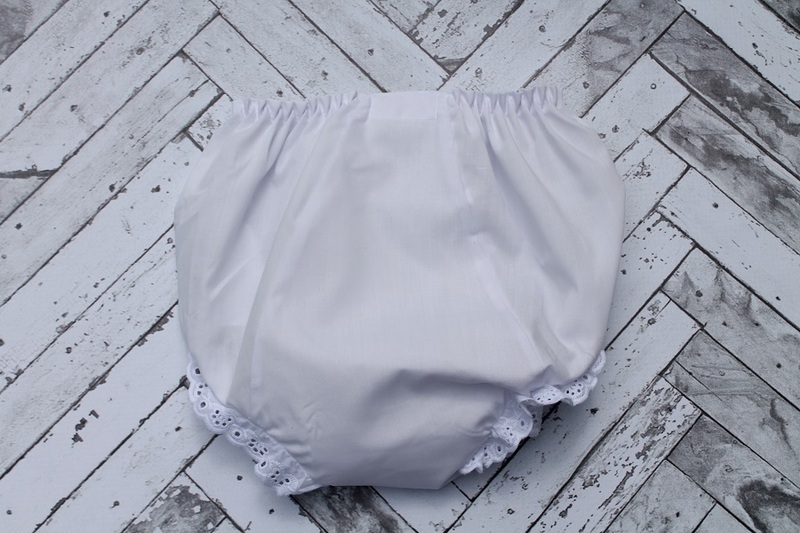 Bloomers are made of 65% polyester, 35% cotton batiste and have a soft elastic waist. Please view sizing charts. A tried and true baby basic! These diaper covers are made of 100% super soft cotton baby rib knit and feature a soft comfortable elastic waist. **Runs large, please view sizing charts. These classic seersucker diaper covers are made of 100% striped cotton, and feature a soft elastic waist. Available in pink, blue and green. Seersucker diaper covers come in ONE SIZE: 0 to 3 months.